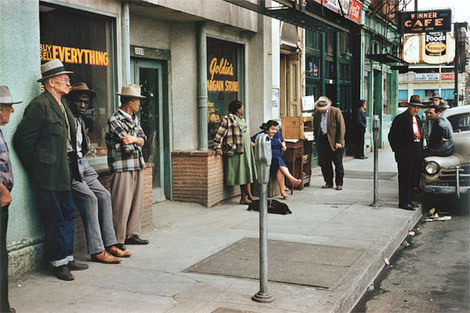 It was shot by Fred Herzog in Portland in 1959. It's included in his recent monograph. That's all I know so far, but I thought someone might know more. Any Portland history buffs out there? Anyone with living memory of the stores shown here? Anyone? Not sure if this helps, but a search came up with a reference to a "Goldie's bargain store" (as per the signage in the window) in Danville IL. The reference is from 1946, so the timing seems close. Looking at that location in street-view doesn't help too much, there's only a few buildings still standing. I do like these challenges. Good luck! To add to my previous comment, this is what E Main Street, Danville looked like in 1910. Looks like the right kind of place for that photo, before all the buildings got knocked down. Thanks for the tips, Rosscova, but I think Danville 1910 is a few thousand miles and half a century east of what I'm looking for. The photo was made somewhere in Portland, OR. This is Commercial Street in Portland Maine. A simple TinEye search on that image was all that was needed. I doubt this was taken in Maine since almost all of Herzog's photography was shot on the west coast, other photos in the book labeled "Portland" were made in Oregon, and based on my experience roaming the streets of both cities this photo looks much more like downtown Portland, OR than Commercial St. in Portland, ME. All of that said, I'm willing to suspend final judgment if you can provide a link or some other evidence supporting the Maine claim. Sorry but my Tin-Eye search turned up nothing. What I've done in the past in this type of situation is to go the local archives or library and get the business directories from that year and look up Goldies. It'll have the address etc. I just remembered that you don't live in Portland! I'd just call the Portland archives and I'm sure someone would be willing to look it up in their business directories. People use them a lot so they wouldn't have to dig through the stacks. only from living in Portland, I guess somewhere around the 1000-1200 blocks of Stark St. SW. It looks very familiar to that area. Good tip. That street is a possibility but no way to tell for sure yet. I will visit the library next time I'm in Portland to see what I can find. I e-mailed the Portland archives this morning and this was their response. Great work, Anonymous. I guess I could've done that if I weren't so lazy. Anyway I just Streetviewed the addresses and all the buildings in the photo have since been torn down. Wondering if any part of Streetview will become archival. Will we be able to Streetview 2011 in 20 years, or does Google erase history as it rewrites? What a shame that they were torn down - but not surprising. It looked like a poorer part of town and those are often the first to go.